Hello, you're listening to the Super Power U podcast. This is episode #16. Welcome to the Super Power U Podcast where we reveal the mental models and tactical skills needed to activate your inner superhero.And here's your host, Lisa Betts-LaCroix. Thank you so much for being with me here again today and if you are a returning listener I’m so happy you’re back. If you’re a new listener a special welcome and thank you for joining me here on the Super Power U podcast. A very extra special welcome to listeners who came to us through Victoria Lorient Faibish’s Facebook live page and to those people who came through Pinaki Saha’s Tuesday Show. I’m so glad you’re here, I’m so glad you found us. It was such an honor to be the guest of not only Victoria and Pinaki but also to be a guest on the Off-Trail Learning Podcast with Blake Boles, who interviewed me about the history and development of independent learning and micro-school movement in the San Francisco Bay area over the past 10 years. If homeschooling and the future of education is of interest, definitely check out our conversation…I’ll link to Blake and Pinaki and Victoria’s shows in my show notes]. Before I introduce my very special guest and I am so excited about my guest today, I just want to say thank you to those of you who have submitted reviews to iTunes. It really does help with the algorithm, it helps reach more people. So thank you Jackie Bernardi who says “What a great show. I love how Lisa allows the show to be what it needs to be. She has a strong and solid perspective that can be helpful to so many. I will be recommending this show to my clients! Great work”. Thank you so much Jackie and if I am correct, Jackie has a podcast that is being released right about now. So if you search for Jackie Bernardi on iTunes you’re going to find her show, too…so check it out. There are a bunch of other reviews too. Thank you to Harshita, thank you also to blue02SS, to Wendy Lister, VacationMaven, Yowusup, Jason Bennet and the rest of you who have given reviews. It is so appreciated. Now without further ado I want to tell you about my very, very special guest today. Elena Grinenko is a World Rhythm Champion and a former Dancing with the Stars professional. She started dancing at the age of 7 in her native country of Russia which you will hear about in our interview. After retiring from competition Elena became a coach and a choreographer for competitive couples and students. She’s a certified adjudicator, a world class judge and choreographer for Olympic gold and silver medalists in figure skating, Merle Davis and Charlie White…Merle Davis is one of my favorites as well as Scott Moire and Tessa Virtue from Canada. She’s a board member for the national museum of the dance hall of fame and so much more. She was a pro-dancer on the hit ABC Show “Dancing with the Stars” and her professional dance accomplishments include being a Russian National Champion in Latin and 10-dance, US National Finalist in Latin and a World Finalist in Latin as well as the US National Champion in Rhythm and 2-time World Champion in American Rhythm. Such an incredible privilege to have her here on the show and so much to learn. This show is not just for my dear dance friends and fellow competitors. It’s also for those of you who need a competitive mindset or a performance mindset for any kind of artistic or competitive challenge that you have. The things we talk about can apply to you too and if you’re not a competitor or a performer, listen in anyway because there are tactics and overarching generalizable mindsets, skill sets and approaches that can be applied to all elements of life. This is the perfect episode for anyone who wants to learn the mindset of a Champion. One of the things I loved most about our conversation (and I really want you to pay attention to this) was noticing that Elena’s dancing and coaching success is all based on helping to find and using Super Powers. In dance, like in the world in general, it’s so easy for us all to focus on our own weakness and as teachers and coaches to focus on the limitations and all that needs fixing and improving in ourselves and our students. 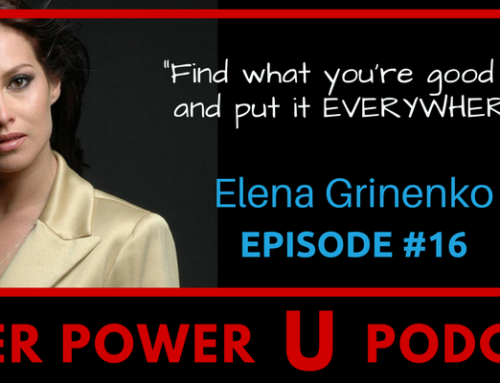 But if you listen closely you will notice that over and over again in the advice Elena offers to us here she’s underlined the power of using strengths as your a competitive advantage. She encouraged us to simplify and not overthink and kept coming back over and over to the importance of finding our unique gift and strength and using it as often as possible. So no question, our guest today is a Super Power Sister. Let’s jump on in and hear from Elena Grinenko. Elena, I was so lucky to have the chance to train with you recently when you were in San Francisco and in the conversation afterwards over our lovely glass of wine, I realized that your experience and your knowledge or are such a huge contribution and not just to those of us who are dancers and competitors, but really to anyone who's interested in understanding the mental models of a champion, anyone pursuing mastery would benefit from us digging in and getting at that framework you have as a top level performer and judge and I'm wondering if you could share something about your childhood or the early chapters of your life that might have formed the foundation of your love of dance and your career. I started when I was seven. That was back in the Soviet Union, Russia. My mom always dreamed to be a dancer when she was little, but I guess her parents decided that that's not something that they want her to do, so she lived her dream through me. She got me into a dancing at seven. I went to a beginner class in September and then what really started my dance career is an absolutely amazing opportunity. There is this boy who lost his partner. I don't know if she outgrew him or she quit, but he was already a Moscow champion of his age. At that point he was eight, so they couldn't find him the right girl. So they said, listen, let's go to the beginner classes and see if we can find a girl that's, you know, goes with your size and hopefully she's a little talented and we'll, we'll go from there. So that girl happened to be me. They approached my mom and said, here's this amazing boy, and he's already dancing for a few years. I think he started when he was just four or five. She has this amazing opportunity, do you want to do it? But now she has to come every day and take private lessons. She needs to have a costume, she needs to have shoes. She needs to do all of those things. And my mom said, “Yes, sign me up. Sign me up.” Right. So it started very serious right away and my mom made me my first costume out of my curtains. They're literally were in the living room and she took a lot of them off and cut it out and made me a dress. So before I turned eight I did my first competition and beginning of December. So the timeline is let's say September, I did just for fun and then October, November, they were getting me ready for that first competition and as crazy as it sounds, it was a Moscow championship and we had 180 couples. So me and my partner became second. So talking about the start, it was like a full on eighty miles an hour introduction to a ballroom. So let me, let me ask you then about that period of time when you were that young girl who was by chance pulled into getting more serious. Maybe, where you really planned for it. It seems to me that anyone who's serious about a sport or a practice that involves work and attention and constant focus can sometimes prefer to do something that's a little bit more fun and a little easier. What was your experience as that child? Were you excited by that possibility or did you have mixed feelings or what was your experience then? Well, honestly it's changed with age. I remember very clearly that when I was a teenager I absolutely wanted to quit because, you know, when you do it so seriously and so right away, there is that moment of excitement and it's all so new and you need so many people because ballroom dancing specifically is an extremely social sport. So all of that is fun, fun, fun but then sometimes you don't get along with your partner. Sometimes at some point, you know, when you, especially a teenager, and you get through this age, oh you like the boys and boys like you. You want to go out. You want to visit somebody else's birthday party and you can't. So there's that moment where you're like, I don't live a normal teenage life and I am constantly busy. Like I used to sleep on subway because any normal child would go asleep by 10. I mean I put my kids to sleep right now at eight, they're really little, but by 10 a hundred percent. I would get home only around to 12 because the dancing doesn't really start until 7:00, 8:00 PM. You still need to go to school? You still need to do your homework. So there are moments where you go, I really don't want to do this. So, my mom, again, my mom has been everything in dancing and she was the huge driver of my career. Not that I didn't want to do it but I always believe it's not just you, it's the right team of people around you that help you achieve your success. By yourself, you're nothing. So your teachers, your parents, your friends in any environment that's around you that helps you get there. She was the biggest driver of all of that and she literally said, “No, you're not quitting. I already paid so much money for this, this and this, and you're already doing this and goes. Until you finish high school, which were 17 when we're done, you're doing that. Then that is that.” So, by the time I finished high school, I already became a national champion in Latin, national champion in 10 dance. So when the Union fell apart I was one of the first kids that were traveling outside of the country for all those competitions. So it just got like double exciting. And when high school finished, my mom literally said – again, because of the Soviet Union split up, the situation of how you pay for dancing and all of those things became so much more difficult and so much more expensive, she literally said, “I can't afford your dancing anymore so if you really don't want to do it, you can quit.” And at that point I said to her, “Are you kidding me? I just started.” So I started working at 15 teaching little kids. Can you imagine teaching a group of 50 to 70 kids in there about six, seven years old while you're 15? That's when you learn the patience. But yeah, I started working at 15 and at 17 I went on my own and since that I supported my own dance career. One of the questions that I often ask people is to share something about one of the challenges or challenging periods of their life because it's really easy to see people who are successful as having a charmed life that has always been easy and, you know, always been successful. And I think there's usually stories behind success that have to do with challenge and overcoming obstacles that you've already referred to that period of time when Russia was falling apart and you were 17 and graduating and your mum didn't have money. I don't know if that would be the one you would point to, but can you say a little bit more about what it was like to be that 17 year old teenager who had won a national championship, but in the midst of this country experience or whatever else you'd share around that period of time? You know what, It's always so it's been difficult I'm not going to lie, but I guess your love and your passion for dance outgrows everything else. You don't really think about, “Oh, how can I get money to buy myself a bread?” You literally think, “Okay, how can I earn money to buy myself [inaudible] stones to put them on my dress? You know?” It's like you're literally so into it that you don't even see all those other things. But to just mention the other period of time, I immigrated to America at 21 with a very basic English. I could see [inaudible] because we used to go to England to take lessons of, you know, all the body parts or quick or slow turn, but not really that much of a conversational English. So at 21, I came with just one suitcase and my partner Michael at that point, and you in this totally different country with zero friends, very basic English, no money, just one suitcase. But you did bring your costumes and shoes and we would rather take lessons than pay for bed. So Michael and I slept on the floor for practically half of a year because we couldn't afford the bed. But we would take lessons and go compete. Your love for something that you do is so strong. Then your choices that you make are different. Somebody else will be like, “Well, I really want the bed or I really want a new dress.” You know, you overlook all the other aspects of it. You know, [inaudible] of dancing I learned on my own to do a lot of things. I can do makeup, I can do hair, I can actually sew dresses. I used to make my own dresses to the point that I would actually sew my partner's pants and shirts and jackets and all of that is a self taught. You go, “Okay, how can I make that more affordable?” Learn it yourself, make it happen. I did not learn how to make shoes. That I do not know how to do. Full on, beautiful ballroom gown from scratch and designed it myself, sew it myself and decorated myself. So that leads a little bit to one of my questions. Elizabeth Gilbert's a writer who had great success with one of her books and she did a TED talk after that about what do you follow it up with? Like once you've reached a pinnacle of success, how do you carry on in your life after that creatively? So, I'm wondering if you can talk about what your life has been like after achieving such national and international recognition and what drives you in your life right now? Because being part of a community really. Exactly, exactly. So that I am still present because I remember being little and looking at all those judges like, “Oh my god, they're like the most important people here.” And I'm one of those people and I don't feel that way. No, not at all. I'm like, well, I'm just here. I'm the same person. Well I think that makes you very charming. You do have such a down to earth and accessible personality. So I'm sure that it really impacts the way that you can influence and support your students too. So I appreciate that. So I did gather a bunch of questions from some of my pro-am competitor friends and other people who compete. I said, “Elena's going to be on my show and what would you ask her?” So I'd like to throw some questions some other program dancers put out to me as things they would like to learn from you. So, a beautiful person that I compete against. Heidi Kellison, wanted to know how you tackled injury. She says, you know, it's inevitable but when you're under such incredible pressure, did you face injury and how did you either protect against it or handle it when you faced it? Yes, I did. I mean there's always little things. So you pull your muscle or you'll get hit because, you know, dancing is beautiful but you do still get injured on that floor. But my biggest one is I had a knee surgery and that was 21. I had a teared meniscus and it didn't just happen in one place, it cracked in two places and went completely lose. So I couldn't not have the surgeries. And after that well you do with boards people do. You go to a physical therapist and through the pain and tears you're get yourself back in shape and you continue doing what you do. I mean, look at all those Olympic sport people like figure skaters, it's amazing. So a lot of dancers get injured, the knees or ankles or hips. So mainly when you're younger, because I guess when you're younger you're not doing things correctly and you're doing them hard and you're doing them repetitively and that potentially causes the injury. So, after that experience and going to a doctor, listening to what it is that they're saying and figuring out how can I do what I'm doing without injuring myself more. So then after that you kind of become smart about your dancing. So if there's certain things I couldn't do on my left knee, I just plainly won't do them. Modify your choreography around it? Exactly. You change things and, you know, like in Zoomlander, he couldn't turn left. How silly is that? But that's really the thing. If you can turn left turn right. So nobody knows your choreography, nobody knows your limitations. Not a lot of people would know that you got injured or not. So you become smart about it. And of course you keep yourself in check if there's a certain supplements you need to take or if you need to do certain exercises before you start practicing. That is the most important one because honestly I heal a lot of times. People get injured in dancing by doing something too fast too soon and it's usually some stupid movie and then bam, you're injured. After that, you have to give it a rest. I know a lot of us, especially when we're young, we go, “Oh no, I can't miss this competition. I really needed to do this black bull” and then you didn't heal and then you practice and you go with it and then you get re-injured. So my suggestion would be go to the correct doctor, not just a regular physio therapist. It has to be a person that works with sports people so they could look at you and say, “Okay, this is what you do and you can't not do it.” So how can we go around it and which muscles do you need to train for that injury to not happen again? So it has to be very smart if you already got injured. So a lot of taking care of yourself and that actually leads into Nancy Lambs question. She wanted to know about your normal diet and also diet during the day of the competition. Like how do you keep your energy level up without eating too much and also how you trained strength and cardio? So sort of general training, eating dietary recommendations is what Nancy's wondering about. So just keep dancing is the diet. Yeah, keep dancing is the diet but it doesn't mean you don't work out or you just eat healthy. Again, going back to growing up in Soviet Union we pretty much grew up with the organic food and like no cans, none of that stupid stuff. If I'm already buying something from the pack, I turn it around and I look at the nutrition. If first three things in those ingredients, I don't even know what they are and I can't read them, I will never buy it. I would buy rather something that says sugar, not some kind of a blah, blah, sugar. Just sugar. Just wheat. Just whole food as possible. Right. Organic and so less preservative food, less canned food because that's where all the chemicals come for them. Otherwise you can eat literally whatever you want. What about right before competing? I always kind of wonder- I usually try not to eat too much, but then I also want to make sure that I'm not going to run out of energy so I usually don't eat before competing, but what did you do? Everybody's different. So you need to know just what's good for your body. If that requires you to eat stupid blueberry muffin, then eat it. Some people will eat pasta because it has a lot of energy or for some people they'll eat let's say chicken coz it has a protein. You definitely should eat. That's hundred percent because food is your fuel. Just chew something that- like protein is a longer-lasting energy. Like if you eat something that's completely carbs, you'll have more energy for the next hour, but then you're going to have a crash. One thing my dad did for me, and it was kind of cool, he mixed walnuts. He will crush the walnuts and mix them with honey and lemon and when he cuts the lemon he actually keeps it with skin so it has sugar in there and lemon on kind of, you know, it's sour and just- So I would eat that. So you can see it keeps you energy like it's a natural sugar because of honey. The nuts have protein and you don't overeat it. The last time I would eat probably would be like three hours before the comp. If I know I'm competing at six. Yeah, I would eat something and you know- Definitely don't do to coffee. I know a lot of people like, “Oh, coffee.” But coffee, you also have a crash, like- just like of the sugar about 30 minutes. Right. Okay, well those are great things to think about. There's another dancer, Chris Mola, who asked me to see if you would share the single best piece of technical and single best piece of artistic advice given to you and from whom you got it. So that's a bit of a complicated question, but I guess they're asking you to think back on your past and like you said, you stand on the shoulders of other people and if there's one thing that stands out. Man, there are so many actually. There are so many. I'll go with two if that's okay. So there is a person who wrote a Latin technique book, Walter Laird. He's like one of the regional guys who started ballroom. He is the teacher of [inaudible] and of [inaudible]. I mean a lot of big, big names in the industry went through him. So we were young kids and we're fortunate enough to have lessons with him and when you have lessons with him, there are things they are so complicated and couples fight about it and you can't figure out what to do. And he would sometimes just say one simple phrase and you kind of feel stupid after that because you're like, “Ah, I guess that is that easy.” But one of the things he told me, I was like, “Okay, well, how do you get there? I have these two spins and one is this way and another one is spiral and I only have two counts to get there and I have like 25 steps. So how do I do them?” And he looked at me and he said, I don't care how you get there, just get there on four. Just get there. Or is it the thing part about your thing just by the time you need to be there, is that what you mean? So basically advice is, don't over think, just do it. Because sometimes we're over analyze things and we break down things so badly and we think about it in so many details which is okay on the one hand is good, but then we never just go ahead and do it. So when you practice, basically what that means for me, yes go through it, figure out what you're doing, but then do that in 0.5 seconds because when you do it in the music, you don't have time to think. You don't. So that's advice for me is sometimes literally, I'm not saying don't think. Think, but think fast and get their on four. That's great. And the second? The second one was Espen Salberg. So he's also a very, very famous dancer. He- when Michael and I danced, there is just one part that everybody would complain that he doesn't straighten his knees and the poor guy would come in in shorts and dance shoes and socks and look ridiculous. So Espen literally went down on his knees to check what's wrong with Michael's legs. And he's like, “Oh, we have the weird kneecaps.” So, so instead of doing the right thing and technique, I'm not going to go into details right now. You actually going to go opposite and you're going to do this instead of the correct way. Let's experiment. And he's dancing literally went from three to eight in a matter of five seconds. And that is another amazing advice from me. Yes. Learning technique and knowing what's correct is important, but at the end of the day it's not whether it's right or wrong, the question is does it look good on you? So sometimes you need to do the wrong things in order to give the right look. That's pretty much another big one for me. Oh, wow! That is a great one. That seems like it really points to why you need coaches because you don't necessarily know when the right time to do the wrong thing is unless you have that kind of input. When I saw you here, we got a chance to talk about books. I love to read books about the psychological practices of masterful sports people and performers. And so I'm wondering if you can share a book that you love and maybe something that you got from that book related to performing, competing or practicing. Just keep on showing up. Yeah, keep on showing up but also know, also know when it's not working because if you're going to put $10,000 into a wrong thing, that's not really gonna get you anywhere. So it's also knowing, okay, this is not working and instead of banging your head into the wall, you just go around the wall and try something else. Right. I know from many pro-am dancers- This is certainly my experience. We spend a lot of time practicing by ourselves. Wondering if you can say a little bit about what kind of recommendations you make to pro-am students around practicing. You're not really interacting with him. Sometimes it's true. You hear it differently in different times. Right. Exactly. It was maybe worded differently or maybe it's a, you know, male female thing. We relate it differently or maybe it's because it finally after a year clicked. So, it's a process. But definitely, do practice. Another advice for practice don't practice just slow. I understand go through mechanics and we want to understand that the foot is going there, the knee is going there, the hip is going there. the body's doing that. By the time you thought about all those things, there's already five bars of music went by. So when you're competing, you don't have a luxury to take that sweet time and think about it. Absolutely go through a mechanical slow process and then speed it up, speed it up, speed it up. At some point you're going to lose it when you speeding it up, back up, slow it down again and again, speed it up because at the end of the day when you're dancing to the music, you don't have a luxury to slow down. You got to go. If you do not practice this fast, then it's not going to happen during a competition. Right. Right. So are you specifically saying that we should slow down and go through step by step – here's my one, two, three, four – very slowly. But then in every practice session we should go through the process of going from working slowly to working up to music speed? Absolutely. How many times do you dance slow at the comp? Zero. So slow is just for your understanding and the knowledge of what the body is going through to eventually make it happen, but you have to try to make it happen to the best of your ability. Whatever the information that you receive, you have to try to make it to the speed of the music. And it might not work from first time, even from the hundred time, but you got to try. But can you imagine if you don't and you only go slow at all times? Your brain and your body is going to freak out on the floor because you have all this other things going on. Your nerves are kicking in. You thinking about the dress, I don't know, I forgot my favorite lipstick. There's judges looking at me. There is so much stress factor. The goal is into already performing or competing. So that's the time not to think about what you do with your hips and the feeds. It's too late. Yeah. So that leads perfectly into [inaudible] question which is she wants to know what you're looking for while you're judging? You know, we all hear there's different things. Some people are looking for performance. Some people are looking for technique. So I guess you would like to know your spin and your philosophy on judging. Right. So there is a lot. So most of the time people look into overall picture, especially if I'm judging a big competition and I have more than 20 couples at the same time on the floor all competing different events. It's amazing. You have literally seconds. I gotta find who competes against who first and then I got to compare them. If I do just the professional competition, I don't have stress of that. They're all competing in the same category, but they still don't get that much time. So it's the overall look and the judging happens very quick. I like it, I don't like it. Bam. Why? It doesn't matter. But if I'm already going to go into details for me personally, musicality is an absolute number one. And I say that to all my students. You could be the best dancer on the floor, but if you're dancing off time, for me, that's the last place. That's not even discussable. So, I guess second thing we'll have to deal with your balance because if you falling all over the place, it doesn't really matter how much you know about technique and the movement. It's not going to show. So those two things are what the first thing that pops into my head. And then, uh, after that, of course, yes, somebody has very interesting choreography. Some has very interesting rhythmicality. Some girls just killer legs that are amazing. Some girls are very artistic with your arms and I'm saying girls because I guess I'm just started thinking about girls right away since I am. Some guys are more artistic and the dancing somehow much more masculine without necessarily better technique. Some have a really amazing chemistry between each other, male and the female. And everybody's very different, so it's hard to say what's better. What I usually say is find what you're good at and push on that. Don't try to be like everybody else because at the end of the day, 20 people judging and they all have different opinion. Right. Well that's fantastic advice and it's a great segway into my next question because my podcast is Super Power U, I always ask my guests if they have a sense of what their superpower is and by that I mean the natural skill that you find showing up in your life, whether it's in your work as a dancer, whether it's in your work as a teacher, whether it's in your life as a mother, whether it's in your process as a business person. And so I'm wondering if you have any sense of – and not everyone does by the way – of your superpower. When I danced, it was my legs. So I have hyper extended, I guess joints, you call a double jointed. Right? So I learned at the very early when I was very little that this is what I do better than other kids. Again, very early in my dance career, I knew that this is my money maker, let's put it this way. And all of my choreography and all of my dancing were based on that part of my body. So I wasn't trying to be as artistic with hands like the other girls. I wasn't trying to be flexible and do 25 splits like other girls. I wasn't trying to be fast because I knew if they are already faster and I'm going to try to catch up with them, I'll be always on the second place. What I was trying to do is stick whatever I'm good at into as many places as I possibly can and show that off. And this is an important part in any artists. Find what you're good at and put it everywhere. Don't try to be like everybody else. And I agree with you, when I coach couples, they'll say, “Okay, well I want to do this, this and this, and this is how I will know look and I don't like that I'm doing this and this.” When they're pro couples, I usually ask, “What are you good at?” But they could not often answer. I'm good at this, like this specific one thing I'm really good at. So that's an important one to find. That is a very important one to find because that's what's going to make you unique. Now that I don't dance anymore, I guess, how did you call that? My superpower. My wonder woman superpower. Honestly, I think it's my ability to simplify when I teach. I think that's my superpower. In my experience of taking lessons throughout my whole career and being a teacher at such a young age, there's been those moments where I was like, “My god, why is it all so difficult?” You know, and yes, their information flies at you from left and the right and people explain different things different ways. So I make people talk and I listened to what they had to say and what their confusion is and I try to explain it in the most simple way. So they go, “Oh, okay, well that's easy. I can do that.” And then when they have that feeling that they actually do it right away, right there on that same lesson. And that's amazing to see when you can touch someone with your words or physically make them feel and they do it. The transformation happens in front of your eyes. I think that's going to be my superpower. That's fantastic. And it fits in so many different ways. Yeah. The funny thing is I don't think I apply to my life. Because usually like I really truly feel that in dance, I listen to what people have to say when they ask the questions, but my husband complains about, he says, “You're not listening. You don't even listen.” And I do realize that I actually do that. It's so funny like the teacher in me I guess takes over and they just go blah, blah, blah, blah, blah, blah, blah. It's funny. I mean different relationships obviously create different- different dynamics for sure. So here's- here's another question for you. If there were something that- because as I told you, some of my listeners are dancers and many are not obviously, but they are people who have something they're up to. Creating whether it's business or working on their relationships, are developing themselves or working on other, some other big passion project or entrepreneurial endeavor. And I'm wondering if there's anything about what you know as a dancer and the champion that could be generally applicable to other people who are not dancers. What would be the top level things that you could say people could take away and say, “Ah, I'm going to work on that”? Well, honestly, the biggest and most important question for me, figure out what you want to do. A lot of people do a lot of things and they run around and they're not really happy, I guess with what they doing. Because if you find something that you really love to do, you're going to do it with all the passion. Doesn't matter how difficult it is. You'll just going to do it. Then you're going to find the ways to either improve yourself or improve that particular part that's not working in your business. You know? Go learn about it. Find different ways how you can apply that knowledge, but for me, love for what you do drives people. You actually, you will find what to do. If you hate doing what you're doing. That's a tough one. I don't even know what to say. If that's a job that I'm doing and I'm going there and it pays my bills, find yourself a hobby. Find something that makes you happy after your work. But you can look at the job like, “Okay, I'm not really happy with the job, but it pays for my hobby, which I absolutely love.” And then you can look at slightly different. Great Point. Great Point. What are a couple of things that really make you happy in your life? Where you get your source of happiness from right now? My kids. I think being a mom is the toughest job in the world. It is But at the same time it is the most rewarding. You know, when you come home and they run to you and they scream, “Mama!” You know, it's just so cute and they crawl into your bed in the morning and they want a cuddle and they give you kisses. And my older one, Magnus is four and a half. He just randomly out of nowhere, he goes, “Mommy, I love you” for no specific reason and it just warms my heart and it's the most amazing thing. So that's my love right now in life. Like we mentioned in the beginning of [inaudible], I do love my wine, not giving that one up. My kids go to bed and then I do my glass of wine. Nice. Nice. Okay, so what do you tell people about dealing with nerves in the competition? Dealing with nerves, you've got to notice actually what makes you more relaxed or more nervous? Everybody's very individual. Like I can talk only for myself. I don't even want to practice two days before the competition. I don't want to hear anything with dancing. It takes my brain off it and then when I do come out dance, I want it. I miss it, you know? So that's for me. During the competition I absolutely know that I need to be in the ballroom at least an hour before I dance ready in my shoes with my makeup because I'm one of those people who hate to be late and I'm always nervous about being late. So if that makes me nervous, be there early. I started getting ready early. If I'm ready three hours before my comp and I want to sit down and watch tv, that's what I would do to get my mind off it. And then when I'm on the ballroom I like to mingle around and talk to people and socialize instead of standing in the corner and getting myself stressed out. But that's me. That's me. Yeah. So do champion level people like you do, they get nervous? Do you get nervous? You get nervous all the time. You get nervous. You get these butterflies in you're stomach. That's absolutely inevitable and I can absolutely tell you I stopped doing shows when I stopped being nervous because when I stopped being nervous I'm like, I don't even know what I'm doing here. So that was the moment for me where I was like, “Okay, I think I'm done” or like I'm truly done. I was done competing and I did shows, for another maybe four years and after that they said, done. Embrace it. Figure out what makes you more relaxed and what makes you more nervous. Like for example, when I danced with Tony, he wanted to literally just go all over the five routines, like very quickly from beginning to the end not even full out, just walk through them. It's not like he's not gonna remember them, but that's something that he needed. So you got a compromise in the partnership because we're not competing by ourselves. Right. So you have to do what he needed for his, for his process. And then he also needed to respect what you needed to do. Exactly. So basically, I said I'll do it but an hour before the comp. So after we go and do those that thing for you, then I can go and then go and not think about it. So he's happy because we've done it. I'm happy because he let me be. So those are the things that you need to notice. And if it's sitting in the corner where the music is plugged into your ears and tower all over your head, so that you're in a zen some kind of a thing. If that's something that makes you productive, then that's what you do. Try different things if you don't know what that is, try different things. And then absolutely have to talk to your partner about what makes you more nervous, what makes you less nervous, so they could respect that because I find in couples that's the hardest because 99.9% people don't do the same things. So I want to be respectful of your time but this is such an important thing and I see it so much, people working through partnerships and breaking up and grappling with whether they should be with this partner, that partner. And I know from being married for almost 20 years, that partnership in general as a principal as difficult. So if you can say a little bit about what advice you give partners about the practice of being partners, that'd be awesome. So people need to have a very clear idea of what they want. So when they have that clear idea and they can deliver that to their other half being able to communicate that this is the most important thing for me, can we please make that happen? And the other person goes, “Okay, but this is what's the most important for me. Okay, great. So we either alternate, let's say we're doing an hour of what I want, an hour what you want or we alternate days. On Mondays and Wednesdays we do what I said. On Tuesdays and Thursdays we do what you said. On Fridays with do a run through. Once we start fighting, it's very difficult to shift from there, but that's it. You know, it's like in any, like in marriage or everywhere, if the people already got to a screaming point, there is no turning out of there except just be done practicing, which is extremely unproductive. Right. What I was going to say that advice you gave is generally applicable for any relationship and the idea that you make sure that you express what you need in the partnership and that you make space for and make time for what your partner needs is, well, it doesn't matter like you say whether it's a marriage or whatever. Super important. Yeah. My husband is very good at it. I've kind of had to learn from him on that. He always expresses himself and whether I want to hear it or not, but I always say, but at least I know. So there are people that they keep it and then it bubbles, bubbles up, bubbles up. And when the fight happens they spill it all out and then that's bad. You know, so it's a good thing, just speak out. Don't make it negative, but speak out and say, you know, this makes me uncomfortable or I'm not happy with that. That's great. So you have a competition coming up and so could you share with both my listeners who are dancers and possibly also San Francisco Bay area people who may have never seen a competition. Share a little bit about what's gonna be happening April 29th? Right. This is my new venture. I'm a very goal oriented person and I will always have to have some kind of a project that I'm working on. So this is my new one. Karina Smirnoff and myself, we've got a competition on April 29th in San Jose. It's a one day competition, but the day before we're going to have actually dance lectures with a lot of judges that's going to be judging a competition including Karina and myself are doing lectures. And then we'll also going to have a welcome party, which is going to be a Latin oriented welcome party. So it's going to be food and cocktails and lots of dancing. So bring your shoes. Yey! Yes. You see, that's I guess my way. It's something to do for fun the day before competition, you know, you're not competing and just coming out and dancing. There's often not enough dancing at competitions. Not, not, not nervous ones you see. I feel like if you go out the day before and have a fun party and have a great time, I think your mental state is going to be different for the day after. And if that makes you nervous, then you don't do it. But I personally believe being in the right state of mind and being positive and having fun doing it is a big key. So on April 29th we're gonna have a competition starting in the morning. And then we're going to do awards dinner [inaudible]. So another party. So, we're gonna award top teacher, top students, top studio and we're going to have fun games. Not going to say what we're doing, but we actually are gonna do some audience participation games, prizes for that as well and just have fun and dance. Great. Sounds fantastic. Well, I'll make sure to put information about the competition in my show notes. But for people who are just listening, you can find information at is it www.dancestarsfestival.com? Great. Okay. So, thank you so much for being here Elena. I so appreciate your time and I'm super excited to attend the competition and to keep on learning. I'll keep going back to this interview and keep learning about how to work on my dancing in better ways. No, thank you so much for inviting me. This has been a pleasure to talk about all of that, especially the superpowers. Well, that was just so much fun. I love Elena. She’s so accessible and fun and generous with her experience and her knowledge. I felt in talking with her how committed she is to helping and giving and you can be sure that after this great conversation I’ll be featuring many more Champion Dancers and other high level athletes and artists to reveal the Super Powers that will support all of our journey towards mastery. If you’re a bay area ballroom dancer please go on and sign up for Elena's competition and if you’ve never seen a ballroom dance competition please do come out on April 29th and see what’s it’s all about. It sounds like this one is going to be extra special and so much fun. You can find information and links in the show notes at lisabl.com/16. If you’re a new listener please subscribe to the show on iTunes or on your favorite podcast platform. Don’t know how to do it? There are links at the top level online page lisabl.com/podcast. Sign up or like the Super Power U page on Facebook so you don’t miss any of my amazing up and coming guests.